No dirt line left behind thanks to a touchless vacuum that’s always ready to get to work. 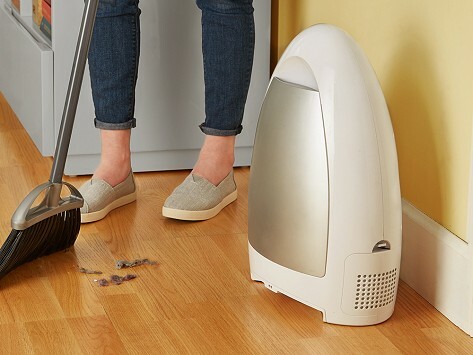 Sweep things like dust, crumbs, and pet hair up to the EyeVac. Infrared detectors sense the motion and automatically vacuum it all up. The roomy canister doesn’t need bags—just empty it into the trash when it’s finally full. Washable pre-motor and exhaust filters help remove allergens from the air put back into your space from the device, too. Dimensions: 12" x 7" x 18"
This vacuum works to clean the air around it, too. Washable pre-motor and exhaust filters remove 99.7% of particles (like allergens) from the air exhausted out of the unit. So, yes, we’d say that cleans up pretty nicely.